Undertakers aren't usually depicted in a very flattering light by the media, so we've got to take what we can get. One of my favorite toy and sticker makers, Gama Go, has introduced this wooden Undertaker toy. It's not really the way I'd like to be pictured, but it is an undertaker, and I think it's kind of cute. 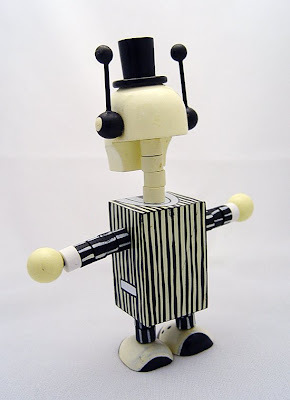 This five and a half inch wooden toy is a new incarnation of Gama Go's 'Deathbot', and comes in it's own creepy box. I keep hoping that Playmobil, the European toy maker of figures for nearly every profession from pirate to meter-maid, to bedouin tribesman, will come out with an undertaker, but until then, I'll have to be happy with this one. He even kind of looks like me! 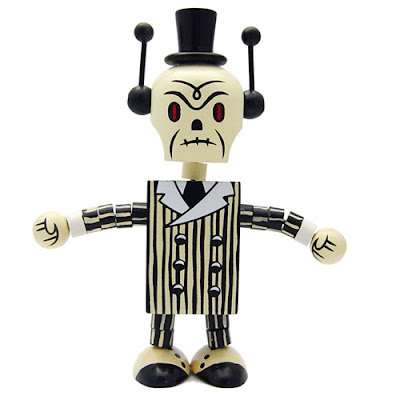 Gama-Go’s Deathbot is back again in a retro-style wooden toy as a gothic Undertaker! This limited edition Undertaker Deathbot dons a debonair top hat and long coat and watches over our passed loved ones. Packaged in a collector friendly window box. Produced and manufactured by Ningyoushi.Gama-Go’s Deathbot is back again in a retro-style wooden toy as a gothic Undertaker! This limited edition Undertaker Deathbot dons a debonair top hat and long coat and watches over our passed loved ones. Packaged in a collector friendly window box. Produced and manufactured by Ningyoushi. Delightful! Your ears as well, Patrick? Your correct, the hat is so you!